Both Helen and I are massive fans of Jane Passy’s Cued Articulation. Cued Articulation is a signing system for all of the sounds used in English. 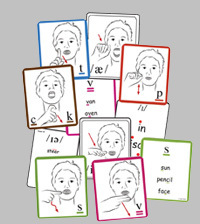 All 49 phonemes have their own hand sign, showing where in the mouth the sound is made and how. – Voice: You can have either a voiced or voiceless sound. This depends on whether the voice box is turned on or not. So a ‘p’ sound is voiceless where as ‘b’ is a voiced sound. Both ‘p’ and ‘b’ are made in the same way using the lips, the only difference between them is the voicing. This is represented by using 1 finger for the voiceless sounds and 2 for the voiced sounds. – Place: This is about where in the mouth a sound comes from. Is it behind the teeth like ‘t’ and ‘d’ or at the back of the mouth such as ‘k’ and ‘g’. 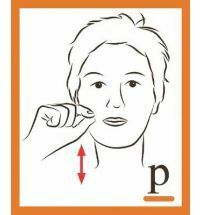 This is represented by starting the sign where the sound is made so ‘p’ and ‘b’ start on the lips where as ‘k’ and ‘g’ start down on your throat. – Manner: This is the way a sound is made. Is it a short popping sound like the ‘p’ or ‘t’? Or is it a long sound such as ‘s’ or ‘f’? It might even be a really tricky sound where you say 2 sounds together! Did you know that a ‘ch’ is actually said by making a ‘t’ and a ‘sh’ together? The popping sounds have a short, sharp movements and the long sounds have a long, flowing movement. Now vowels are slightly different. They are all voiced and are graded by whether they are made towards the front or back of the mouth and how open or closed the mouth is. The really clever bit about Cued Articulation is that it gives information about all of this in a single sign! For example a ‘p’ which is a voiceless, bilabial, plosive – meaning no voice box, made with both lips and it’s a popping sound – is made by putting your index finger and thumb together, putting them by the corner of your mouth and then pulling them apart as you say the sound. How to use Cued Articulation in therapy. – To support sound production in therapy. I always sign the sounds I am targeting as I say them. We all know visual support is really useful for all children. I also find that it is an easy way to encourage the child to look at your face without directly asking them. They have a better chance of making the sound correctly if they are looking at how you do it. I use it when teaching a sound and it is also great to help with generalisation as well. If the child forgets their target sound you can say the word and sign their sound, which often makes them have another try at the word! I also find it useful when working on multisyllabic words. Children often miss out some of the consonants in the middle of longer words, so you can sign the ones they miss out. I never directly ask a child to use the signs, but find many children enjoy them and naturally copy them. The ‘f’ sign actually helps some children achieve the sound as you can push the lip in to make contact with the teeth. – To support phonological awareness. When children are first attempting to sound out and blend words or trying to listen for the sounds in words, Cued Articulation can help. I know one school that have adopted Cued Articulation instead of the jolly phonics actions as they find it so useful. I use it most for word final sound discrimination; you let the child try on their own, but if they can’t quite hear the sound I model the word again but sign the final sound. So if you are interested and want to find out more, do go and look at Jane’s website. You can also watch video’s of the all the sounds here. I love your website!!! 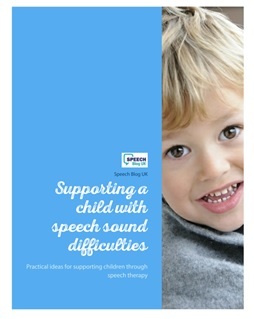 So many useful tips for supporting my son, who attends an SLCN unit nursery. The on-site therapist has introduced me to cued articulation, which is really working in helping him produce sounds he has never been able to say. 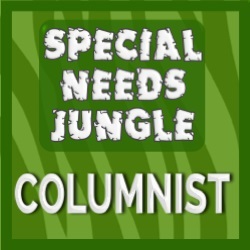 Great article-thanks! Glad you found it useful. We both find Cued Articulation really useful for teaching new sounds – it really helps children to have a sign to attach to the sound. Hope your son gets on well at the SLCN nursery unit. Do you have a downloadable set of the cued cards? Unfortunately they are copyrighted so we can’t give them away – sorry.